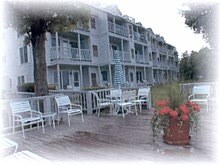 The North Shore Inn is a charming New England style condominium hotel on Grand Traverse Bay. With a picturesque beachfront setting with a private 200′ sandy beach, outdoor heated pool and sundeck, and 26 spacious luxury 1 and 2 bedroom units with completely equipped kitchens and sleeping up to 5-6 people, the North Shore Inn offers a perfect setting to enjoy the four- season beauty of the Grand Traverse region. The hotel is centrally located and convenient to dining, shopping, golf, snowmobiling, skiing, two nearby gambling casinos and numerous award-winning wineries. In the off-season, reduced weekend and mid-week packages are featured, as well as AAA and senior citizen discounts.